Cute for my sons lumberjack themed room. 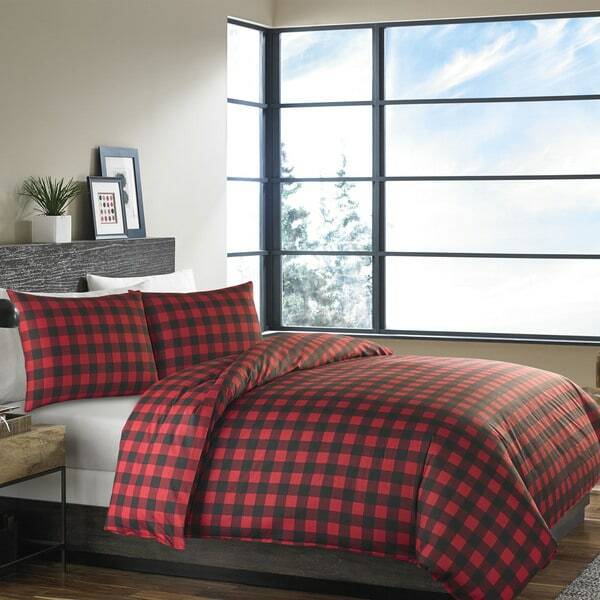 Taking stylistic cues from the classic buffalo check, this distinctively geometric plaid duvet cover set flaunts an iconic plaid pattern in red and black, offering a rustic coziness fit for the best of getaway cabins and so much more. Its soft, entirely cotton material ensures warmth. Very nice duvet cover, the color is vibrant and looks just the photo on Overstock. I like that it comes out of the dryer mostly wrinkle free, but if you want a super crisp look you will want to drag out the iron. The only negative for me, the duvet cover didn't come with inside ties to hold down the duvet. However, for the price it was still work it and my twin duvet doesn't slip around too much. I love the print and the fabric feels nice but it is thinner than most duvets/pillowcases. Not sure how much that matters. Also, the full/queen down comforter I bought for it is bigger than the duvet. It's on my 9 year old son's bed and it looks great and he likes it so overall it's nice but not 5 stars. If you want this look without spending a fortune then this is perfect for you! Love this duvet. Buffalo plaid is a classic pattern and looks great in any room. Very soft and as others have said "thin" to the feel but no worries as it holds up wonderfully. The cover is a perfect match to the images on the website. It arrived quickly and well packaged. Just as a point of caution, this is ONLY the cover and not the Duvet itself. Good but not the best quality assurance!! I like this duvet just fine. The print is nice, and it looks lovely on our bed. The quality of the fabric is a little thinner than I'd like for sure, especially for the price. However this set is way more expensive elsewhere, and I'd never pay full price for it! Also, unbelievably I had to actually use a seam ripped and *rip out topstitching that was incorrectly added*. No joke, thank goodness I sew and actually OWN a seam ripper. The two long edge are top stitched, and obviously the person manufacturing it started down the wrong side and only partially pulled the incorrect stitches out. For $** that is absolutely unacceptable-- for the full price, ludicrous. Not Overstock's fault, that's Eddie Bauer's fault but since I purchased it through Overstock, nto sure I can really complain to EB. I was appalled, however! I knocked 2 stars off just for that. You don't expect to pay a high price for a relatively luxury good and then have to rip out stitches yourself!! I dont have a single negative thing to say about this Duvet cover set. Very high quality material for the price. I was skeptical about it at first but bought it anyways as opposed to buying a whole new comforter set. I couldn't be more pleased! This duvet cover is really thin. It has nice colors, but I still need to get the duvet to put in it as it does not lay nice without that. Like this duvet a lot! Only reason not a 5 star is there are no ties on the inside corners to keep your comforter insert in place. I do love that the opening for the comforter is not on the very bottom end, but up further on the backside of the duvet - keeps the duvet from hanging out at the bottom. All in all, very happy with the purchase. i bought this duvet cover set for my son's cabin themed room. It's perfect with dark brown and ivory accent pieces. It would also be nice for Christmas. Love love love my duvet cover set! It's a great addition to our modern country bedroom and I couldn't ask for a better quality! Bright crisp color. Light weight. Seems durable. Ive had this for a couple weeks and love the look it! The material is a little thin and it's not very soft, this may change after I wash it with fabric softener. Only complaint is that I wish the fabric was a little thicker. Super fast shipment. Exactly as pictures and descriptions. Good quality and design as pictures. Highly recommend this duver set ! Will shop this site again for sure. Perfect buffalo plaid for a rustic feel!!! They held up well after the first wash and they are very warm and cozy without feeling to heavy! Love the look and is very warm. Perfect for our mountain home. I love this for the winter season. Very good quality and fast delivery. "Just bought this in Queen size. What size comforter do I put in this queen duvet cover?" You will want to use a queen size comforter in the duvet cover. "I just bought the twin set Nd would like a second pillow case. How can I order one?" We do not have this pillowcase separately. No corner ties. Wish they did but other very nice. "what is the weight of the king size duvet cover?" This duvet cover weighs approximately 2 pounds. "Is this set wrinkle free?" Hello Kbeach, this set is not listed as wrinkle free. Thanks for shopping with us! this was the cheapest price I could find for this item anywhere and it is exactly what we were looking for!